Rockstar Energy Racing headed to St. Louis, MO with only one healthy rider under the tent in Cole Thompson. The team has been bitten hard by the injury bug this year and Ivan Tedesco was unable to race after his nasty crash last week in Toronto. This weekend marked the last East Coast round for the next 4 weeks until the series reconvenes in Metlife Stadium in New Jersey. Cole Thompson was coming off his best career finish in Toronto with his first top 5 as a professional rider. He entered St. Louis on a high and was poised to repeat his performance from Canada. If it wasn't for a couple of mistakes in the main event he would have done just that. Thompson messed up in a corner and was forced to double a triple allowing 2 riders to blow by him. He was able to regain a couple positions however, putting himself in a position to have a chance, but came up just short with a commendable 6th. Cole has had a pretty consistent series thus far and has finished in the top ten in almost every race. Cole Thompson: "Qualified 10th in practice and 5th in my heat race. I had a so-so start in the main, maybe inside the top ten. I got up to 6th at the end, but I felt like it could have been a top 5 again. I just didn't push hard enough and made some mistakes in the middle of the race." 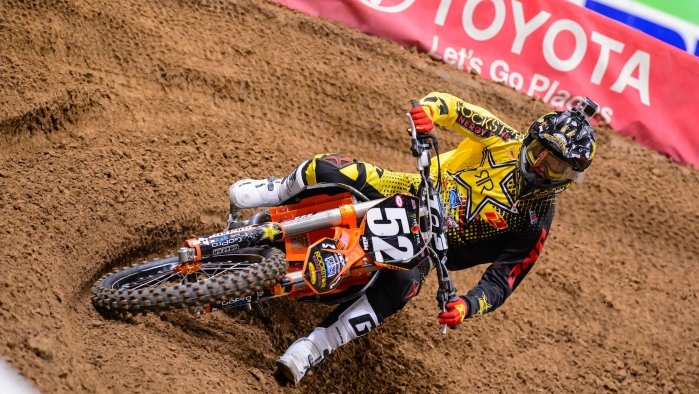 The series will now head to Houston, TX and reunite with the 250 West Coast Series. Thompson will be on break until the East Series returns. Tedesco will continue to heal his wounds and return to racing. Jason Anderson will look to pick up where he left off and extend his championship points lead.